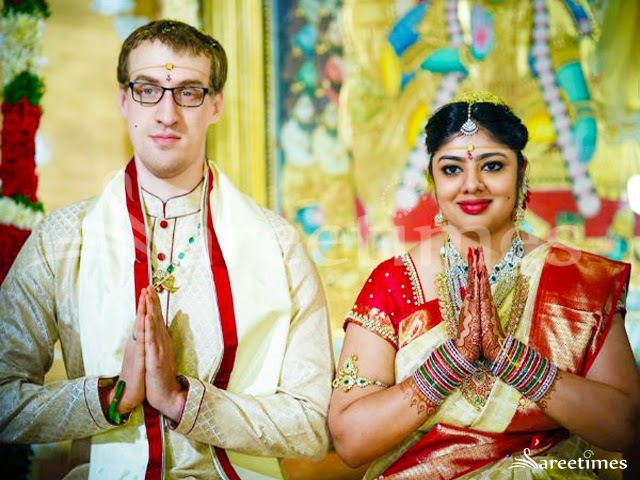 Blue and gold designer bridal kanjeevaram silk saree embellished with kundans. 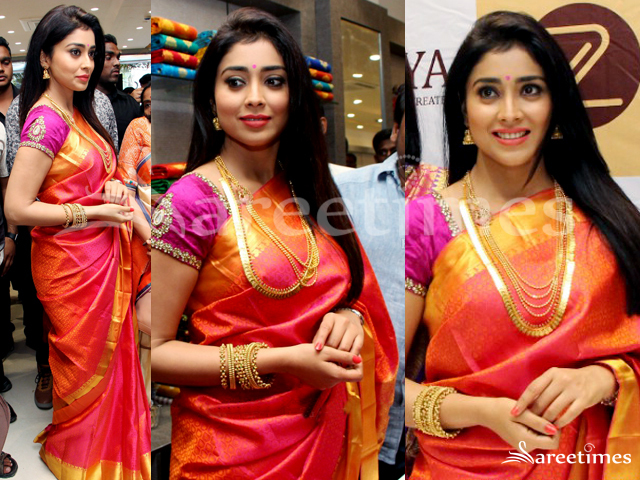 Shriya Saran inaugurated the Zasya showroom in Hyderabad. She was seen in an orange and gold color kanjeevaram saree with golden border, paired with kundan work pink color short sleeves blouse. Actress Vidisha at Harinath’s wedding reception in white net fancy saree with embellished border, paired with short sleeved gold and silver kundan work blouse. Viranica Manchu in a gold color embellished kanjeevaram saree with yellow border followed by red and gold zari mixed border paired with elbow length sleeves yellow kundan work blouse. 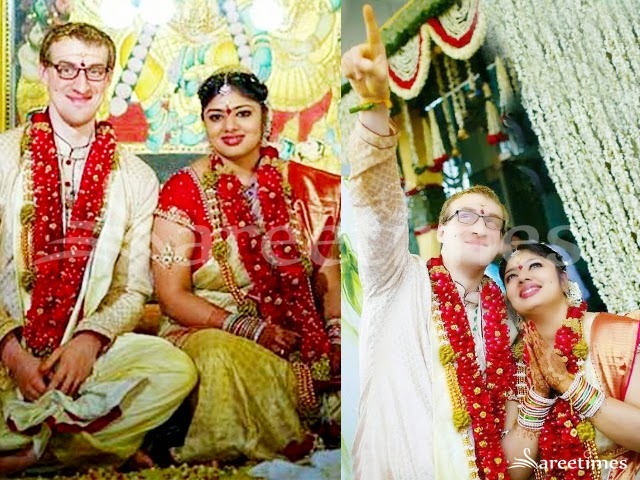 Jagapathi Babu's daughter Meghana at her marriage in a traditonal kanjeevaram saree. White and gold combination kanjeevaram saree featuring pink and gold zari border paired with pink kundan and pearl work blouse. Vedika at "Edison Awards" event in pink embellished netted saree paired with a green heavy kundan work blouse. 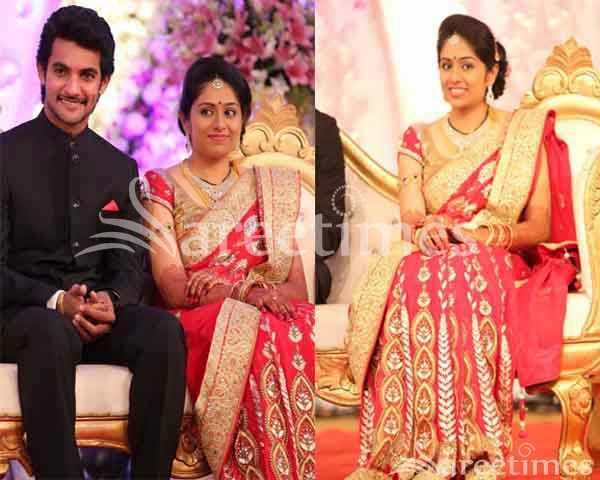 Actress Vithika Sheru at New wedding collections launch in lemon yellow silk saree with blue border with golden color peacock embroidery and zig-zag lines borders and floral imprints over the saree, paired with heavy embellished zardosi, kundan and stone work designed blouse. 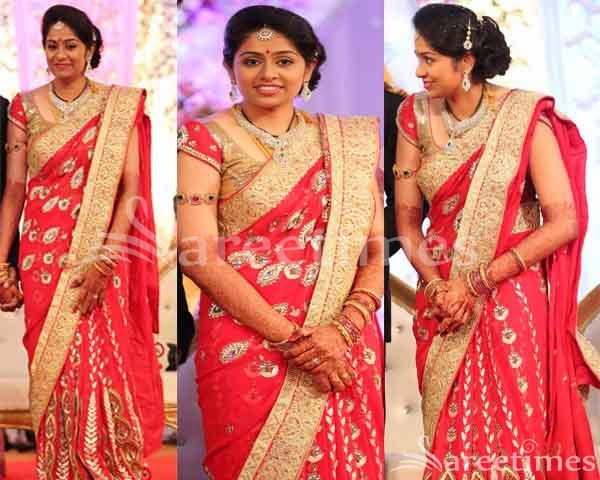 Actress Sanjana in pink color designer saree with heavy kundan works, embellished mirror and stone works with golden color zari designs over the pleats , paired with black golden zari borders and luxurious patch works blouse. Actress Lekha Washington in peach color silk saree with golden color zari border and lace hemline, paired with the blouse designed with purple color sleeveless blouse patterned with kundan works around the neck. Actress Urmila Matondkar at Riddhi Malhotra Tejas Talwalkar Wedding Reception in white saree with floral imprints over the saree with contrast red zari border and the luxurious golden embroidery and stone works over it, paired with red blouse with heavy kundan work blouse with elbow sleeve blouse. 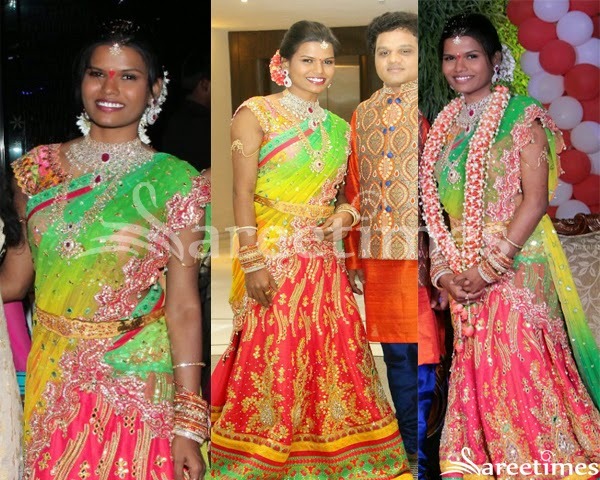 Fashion designer Sashi Vangapalli at her engagement wearing a peach lehenga. Green and yellow dual shaded dupatta with kundan work border paired with kundan work floral print blouse. Models walks on the ramp for Gia Jewelers at IIJW 2011. Models walks on the ramp for Swanshukla Gems at IIJW 2011. South Indian actress Tamanna in beautiful purple designer shimmer embroidery saree with sequins buttes ,kundans and lace border work paired with sleeveless designer saree blouse. Shweta Tiwari the winner of “Big Boss 4” in designer pink saree at the award ceremony. The faux crepe material saree in pink is highlighted with bright kundan stone work border and sequins butties throughout. It is paired with designer saree blouse with halter neck pattern.